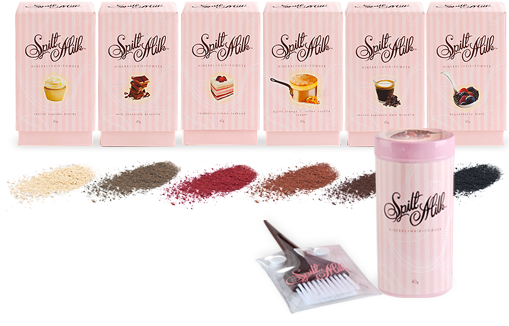 Spilt Milk's Luxurious Mineral Hair Powder will keep blonde, light and dark brunette, red-head, copper-haired, and black-haired gals looking their most fresh, re-growth free and gorgeous in between shampoos, fab blow dries, and colours. Spilt Milk will help hide re-growth (including greys) and absorb oil from the scalp, leaving hair light, manageable, and divine. There are yummy personalised and dessert-inspired fragrances for every woman who wants to look, smell and feel like a goddess. Spilt Milk is decadent luxury that fits in your purse – perfect for busy gals on the go.